Everyone knows what happened with Samsung Galaxy Note 7, it exploded, literally and figuratively. Samsung refunded money to the people and right when the Samsung Galaxy Note 8 was around the corner, Samsung dropped the Samsung Galaxy Note Fan Edition. 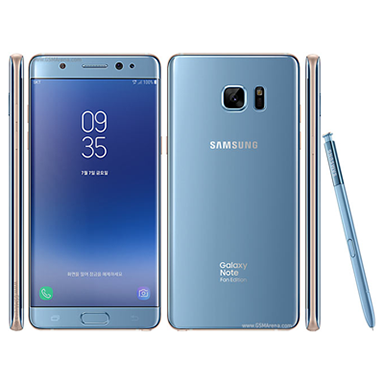 Samsung fixed the issues with Samsung Galaxy Note 7 and sold it as the Samsung Galaxy Note Fan Edition. Samsung Galaxy Note Fan Edition has a smaller battery for obvious reasons. The phone is powered by an Exynos 8850 octa-core chipset along with 4GB RAM. The fingerprint sensor is on the front of the phone. The display on the Samsung Galaxy Note Fan Edition appears to be a tad bit warmer. The selling point of this device is the S-Pen, through which you can control a lot of functions on the phone. Also, the S-Pen differentiates the Note series from various other Samsung devices. 2019 is the year of bezel-less phones and Samsung Galaxy Note Fan Edition has a huge chin and forehead which doesn’t quite fit in 2019. So, if you want to sell your Samsung Galaxy Note Fan Edition to get your hand on a new and better phone, you should do so on Cashify. Why Sell Your Old Samsung Galaxy Note Fan Edition On Cashify? Cashify unlocks the best price for your old smartphone by assessing the value of your phone through simple questions. If you want to sell old phone at the price quoted by Cashify, you can schedule a free pickup of your device as per your convenience. Payment is made as and when you hand over to the Cashify agent. It totally depends on you how you want to accept the money. You can accept payment via bank transfer, e-wallet payment, or cash. So if you want to sell old Samsung Galaxy Note Fan Edition or any other old phone for that matter, just log on to Cashify and sell it in 3 simple steps. Cashify is the most trusted platform in India to sell mobile phones online and other gadgets for instant cash on pickup. Schedule a pickup now!